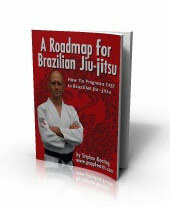 About a year ago, while searching for additional online resources, I came across an offer for a free e-book called ‘A Roadmap for Brazilian Jiu-Jitsu.‘ As a beginner, there was a lot to be learned from this book and I still look back to it from time to time. To get the free download, you have to sign-up for the newsletter using the link below (you can unsubscribe at any time). The newsletter is really where the resource caught my attention though. I have found over time that the almost daily newsletter and insights provided by Stephan Kesting and all of his guests have helped me to progress and to better my game. Unlike many of the other mailing lists I have subscribed to, Grapplearts is not constantly pushing some sort of hard sell on you. If you are new to Brazilian Jiu-Jitsu or just think that you could better your skills with a few adjustments here and there, check it out. I assure you it will be worth your time.